Staying on your patio, especially during summer, is a great way to cool down. Now, to make your stay more comfortable, you should consider investing in an offset patio umbrella. For this post, we are going to review the top 9 best offset patio umbrellas available in the market today. The following umbrellas vary in sizes, shapes, and price. We will help you to find the right umbrella that matches your house’s architecture and of course, your budget. Let’s get started with the Abba umbrella patio with dual wind vent. This nine by nine-feet square umbrella is made of polyester fabric that can resist extreme sunlight. It also does not fade and provides 98% UV protection. It requires little to no maintenance. The pole and eight steel ribs are coated with bronze powder. In that way, it can resist rust, corrosion, and peel. You can quickly open and close the umbrella thanks to its crank lifting system with five-position vertical title function, allowing you to adjust the angle with ease. The dual vented canopy provides maximized airflow and excellent stability. Both fiberglass rod and storage cover is included in the package. Next, we have a Khaki umbrella garden from Purple Leaf. 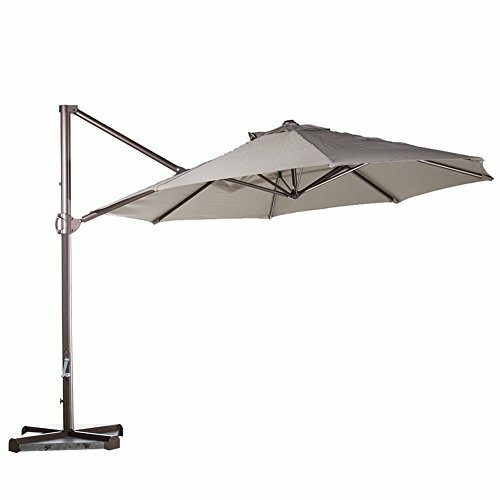 This 11-feet diameter umbrella features a unique double-top canopy design for both commercial and residential use. It also features a unique handle design and crank system. There are six height and angles that you can choose from. Made of 100% polyester, rest assured that this product does not fade, corrode, or rust over time. It also provides strong UV protection. The all-aluminum umbrella bones and eight heavy-duty ribs are pray painted with anti-oxidation. Your family can use this garden umbrella for many years to come. The package includes both the storage cover and cross base. But if you want to buy the weights, it is sold separately. 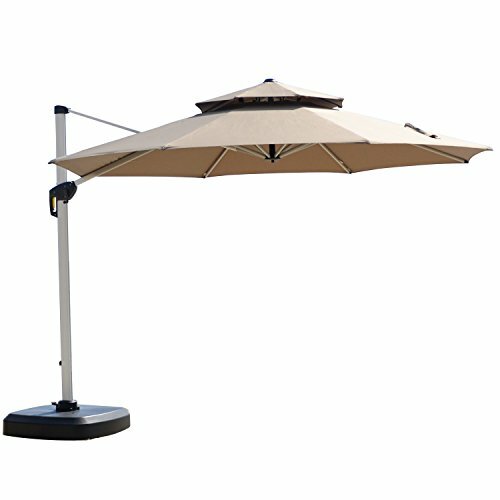 Check out this Mefo Garden patio umbrella. 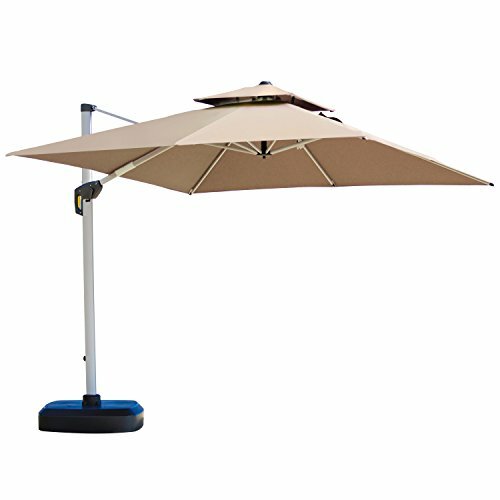 It features a deluxe crank handle that easily lifts and adjusts the umbrella into four positions. It also has a tilt system that allows you to achieve the desired angles of shading area. You can control the 360-degree rotation of the product using its foot pedal system. It has an efficient solar panel that supplies reliable power for its LED lights. It includes a charger that you can use in special weathers, lighting up your patio for a romantic dinner at night. This umbrella is made of 250g/m2 polyester canopy with high-level colors fastness and intense UV blocking for added protection that includes an air vent. The heavy-duty pole is coated and has seven supporting ribs that are resistant to rust and corrosion. With proper use and maintenance, rest assured that this product can last for a long time. Another product we’re going to review from Purple Leaf is the Khaki offset hanging umbrella that’s ten-feet square. Similar to the previous product from the same manufacturer, it has a double-top canopy design for superior durability. Thanks to its unique handle design and crank system, even a child can open and fold this umbrella. You can choose from six height and angles to provide the shaded area. The umbrella is made of high-quality 100% polyester fabric that’s UV resistant, waterproof, and will never fade. It also has an all-aluminum umbrella bone and eight heavy-duty ribs that’s anti-oxidation spray-painted. If you are looking for a patio umbrella that can last all seasons, this one is for you. This adorable-looking offset garden umbrella from C-Hopetree features rib lights and distinctive central hub light. A solar rechargeable battery powers it. Should you want to have a romantic dinner with your family in the garden, you should consider this product. It is made of premium solution-dyed polyester that will never fade, mold, and provides UV protection. 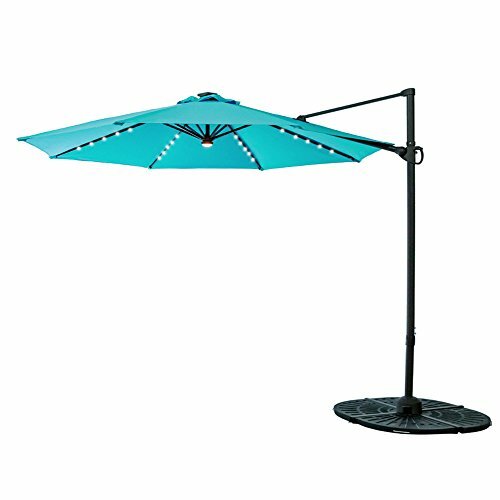 This garden umbrella is a smart buy with its infinite vertical tilt positions and full 360-degree rotation to offer unlimited shade options. It’s reliable and easy to use, perfect for weekend family bonding in your garden. 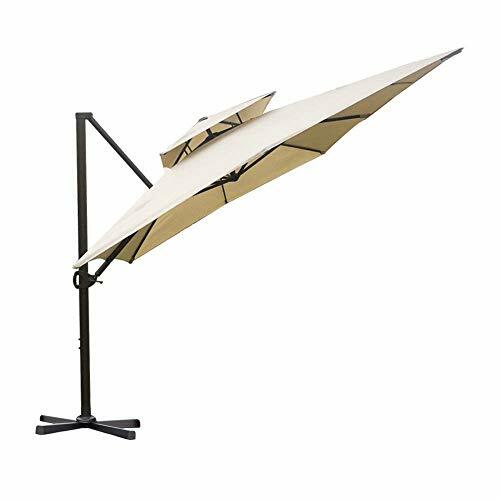 Next, we have the tan-colored Abba Patio garden offset umbrella. It is made of polyester fabric-high sun resistance that can last for a long time. As what we’ve mentioned, you need not worry about fading, rusting, or even cleaning the product. It provides up to 98% of UV protection once installed. The frame is composed of the high-quality aluminum pole and eight steel bronze-powder coated ribs that can prevent rust, corrosion, and peel in the long run. Its solid construction also provides great stability once you put up the product. Thanks to its crank lifting system, you can easily open and fold it in just seconds. Choose between the five positions vertical tilt function. The package includes a storage cover, but weights are sold separately. 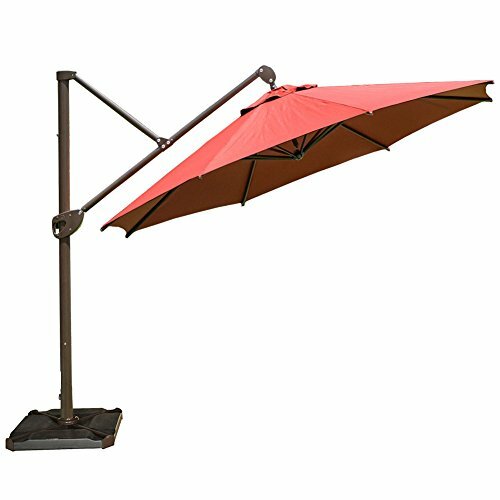 This eye-catching Snail offset cantilever patio umbrella in burgundy color is both stylish and highly functional. The thick powder coated canopy is resistant to fading and can withstand harsh weather. It can also block up to 98% of harmful UV rays. Turning your umbrella to your desired position is made easier with its 360-degree rotation. It also features a 2.2-inch powder coated aluminum pole in dark bronze frame that’s also resistant to rusting and corrosion. The eight steel ribs provide support that can withstand against strong winds and heavy rain. Thanks to its crank mechanism and glide handle, you can easily open and close your umbrella. Adjusting the heights is just a breeze thanks to its glide handle. Note that the package does not include the weights and you need to buy it separately. 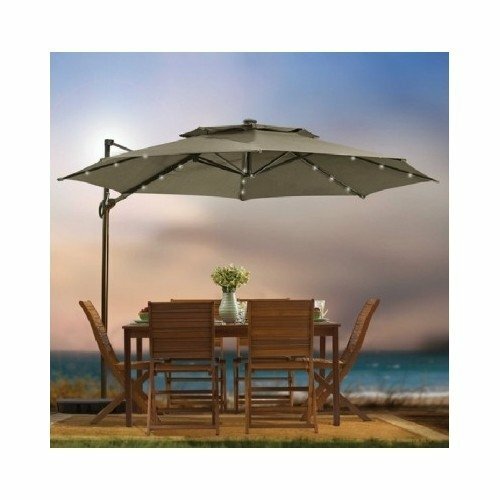 Enjoy summer in your garden with the help of this outdoor patio cantilever umbrella from Destination Summer. You can adjust its tilt position and can rotate it in full 360 degrees easily. The umbrella features 24 LED solar lights. There are three LED lights on each rib of the umbrella to provide a subtle amount of light—the perfect way to hang out at the garden for evening talks. The materials used is mildew, fade, and weather-resistant. In fact, it does not require any maintenance at all! The package includes a base and a storage cover for your patio umbrella. A great deal for its advantages at a lower price! 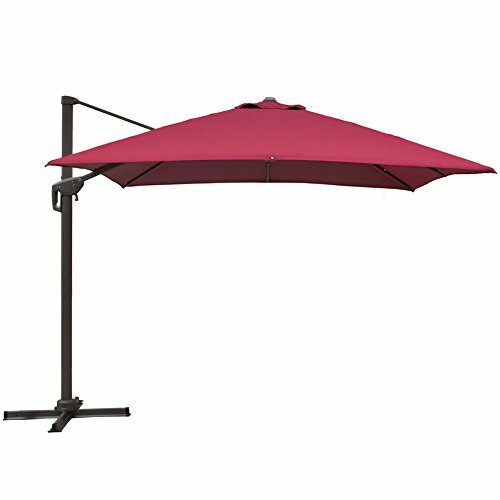 Lastly, we have the Abba patio offset umbrella in dark red color. In its stylish round shape is an 11-feet canopy that’s perfect for both residential and commercial use. It is made of 100% polyester fabric that can resist extreme sunlight and will not fade. For exceptional stability, this umbrella has a two-inch powder-coated aluminum pole with eight heavy-duty ribs that can support once installed. 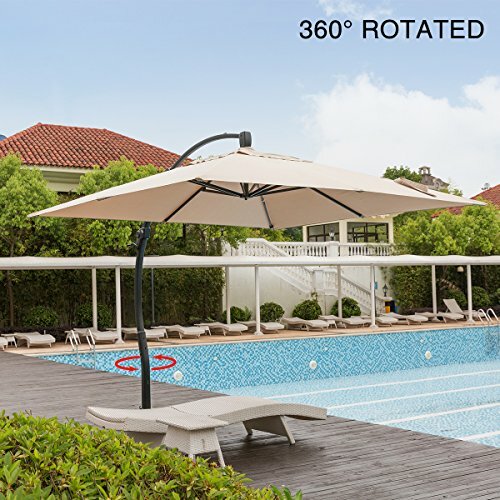 Choose from six different tilt positions of this umbrella and rest assured that it provides a more extensive coverage compared to traditional patio umbrellas in the market. The package includes weather and fades resistant storage cover, but weights are sold separately.